Kimchi is a popular Korean side dish made from fermented vegetables and chili paste and served with nearly every meal. While most varieties of kimchi are made from fat-free and low-calorie vegetables, some preparations are more caloric and fattening than others. Learn what to look for when ordering or purchasing a kimchi dish and you'll enjoy all its health benefits without gaining weight. While kimchi isn't always made from the same vegetable, cabbage and radish are the two most common base ingredients. 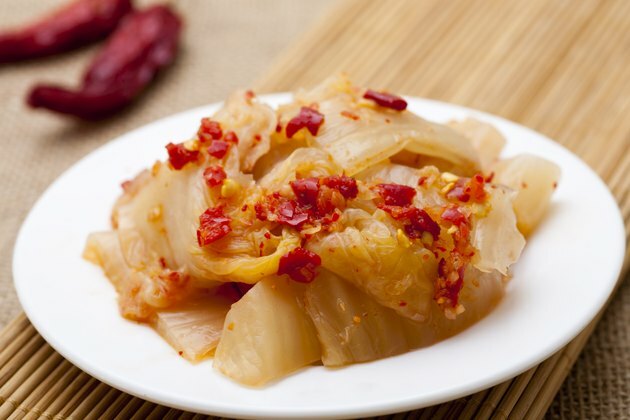 A 60 gram serving of cabbage kimchi contains 10 calories, less than half a gram of fat and 1 gram of protein. In addition to being a low-calorie and nearly fat-free food, cabbage is rich in vitamin A, calcium and iron, radish is rich in dietary fiber and the red chili peppers used to flavor kimchi offer both vitamins A and C. Kimchi gets its distinctive sour flavor from the fermentation process and contains active lactic acid bacteria. According to MayoClinic.com, eating probiotic foods, such as kimchi, could help treat a variety of digestive disorders and prevent colds and flu. A 2011 study published in "Nutrition Research" studied the effects of adding kimchi to the diets of 22 overweight or obese adults. Subjects were randomly assigned to a fermented kimchi or fresh kimchi group and consumed the food during two four-week phases separated by a two-week break in the middle. The study found that both groups showed improvements in both body weight and composition, while the fermented kimchi group demonstrated decreased waist to hip ratio and fasting blood glucose levels, as well as greater improvements in blood pressure and total cholesterol levels than the fresh kimchi group. Raw kimchi, particularly the fermented variety, is a low calorie and nearly fat-free addition to your diet, but not all kimchi is served raw. When dining at a Korean restaurant, many dishes including kimchi also include added fat. Kimchi tofu, a common Korean dish, involves sauteing kimchi in oil before serving, adding significant fat and calories to the dish. Korean soups, like kimchi jigae, simmer kimchi in a soup with chunks of fatty pork belly. While kimchi by itself isn't fattening and may actually help in weight management, it may be linked with another serious health condition. Gastric cancer is the most common type of cancer found in Korea, and kimchi could be part of the problem. Researchers with the Department of Preventive Medicine at Seoul National University College of Medicine reported in the "International Journal of Cancer" that pickled vegetables, such as fermented kimchi, increased the risk of stomach cancer while fresh vegetables did not. Increased salt consumption also appears to be associated with increased risk of stomach cancer, and many kimchi dishes include salty brine or fish sauce. MayoClinic.com; Probiotics -- Important for a Healthy Diet? ; Katherine Zeratsky, R.D., L.D.